We are a team of highly capable workforce that are able to meet the high quality standards demanded by our customers and the regulatory bodies. Our production team set-up is flexible and is constantly working closely together with our customers to meet their operational constraints. 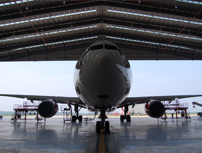 Our MRO services are highly appreciated by our Low Cost Carrier’s customers in the highly competitive and price sensitive Asian MRO market.